There is a low crack. I drop down with a crash as my right foot falls through the iced-over edge of the small stream I am crossing. Then I blast into the surrounding sheet of ice with my left knee. And suddenly I am swimming in a cold grey stew of ice chunks. I try to stand but the water is almost up to my waist; too deep to scramble up out of. Suki, always five feet ahead of me on her leash, had already reached the other side safely. She looks back at me worried as two of the three long-legged men ahead of us reach down to grab my arms and drag me out. Twenty-nine hikers and six dogs on the New Year’s Day hike at the Six Mile Creek Gorge Trail stare at me as I flounder about in an effort to stand up and show I’m okay. “Do you want to swap pants with me? I’ve got on other layers so I can give you my dry pants,” my friend Liz’s daughter calls to me in front of everyone still waiting on the side of the stream I left. “You’ve got an hour’s hike back to the cars,” someone reminds me. And then I notice the puddles in my hiking boots. But the water in my shoes seems warm enough from my sweaty feet. So I test my left knee cautiously and decide I can walk back. Suki does not take her eyes off me as someone lifts her back over the stream at a narrow unbroken spot. I follow behind, thinking poor Suki, after losing Marika, she hates to leave my side for fear of losing me; thinking, since losing my daughter I’ve become very accident-prone and clumsy; thinking, “Why always me? It’s time for someone else to fall and get all the attention. And finally, this is not a good sign, starting off the New Year with a splashdown. Two days later, with frazzled nerves, a neoprene sleeve around my knee, and wire-pronged YakTrax on the bottoms of my hiking boots, I leave Suki at home and show up for a hike with the same group at the Ellis Hollow Nature Preserve. I’m hardly recognizable to them without my little white fluffy dog attached and pulling at me. It’s the first hike in over two years that I do not follow Suki. And two days after that, I go out again, without the neoprene sleeve and without Suki. I am dog-sitting for my friend Liz’s dog, and a hike with two dogs on leashes in the ice and snow is more than I am ready for. So I hug Suki and Hobbs and leave them with rawhide chews on blankets by the door. I head out alone to the South Rim Trail of Taughannock Park. The falls there are stunning with long dripping icicles, bright patches of snow and steamy rushing waters below. It feels good to have two free hands so I take photographs. 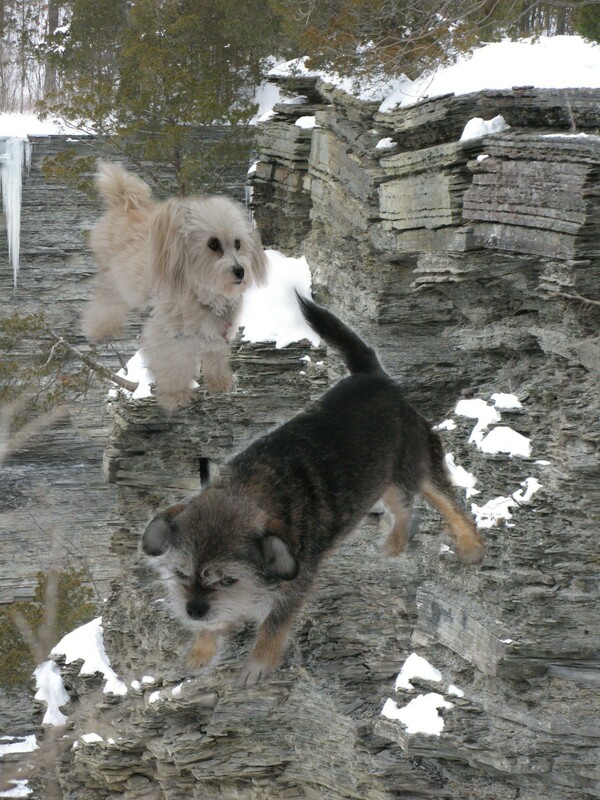 But I keep looking up and thinking of small dogs flying off the cliffs of the gorge. This entry was posted in 2013 on 2013/01/07 by Robin Botie.